With more than six months left until The Maze Runner sequel The Scorch Trials hits theaters, 20th Century Fox is putting the follow-up The Death Cure into development. The studio has hired T.S. Nowlin to write the screenplay adaptation based on James Dashner's third chapter in The Maze Runner novel series. T.S. Nowlin co-wrote last year's The Maze Runner with Noah Oppenheim and Grant Pierce Myers, and he has sole writing credit on this year's sequel The Maze Runner: The Scorch Trials. What remains unclear at this point is if 20th Century Fox will also develop James Dashner's fourth novel in the series, a prequel entitled The Killing Order, which is set 13 years before the events of the original book. It also isn't known if Wes Ball, who made his directorial debut with The Maze Runner and returned to helm The Scorch Trials sequel, will be back to direct. The Maze Runner: The Death Cure. 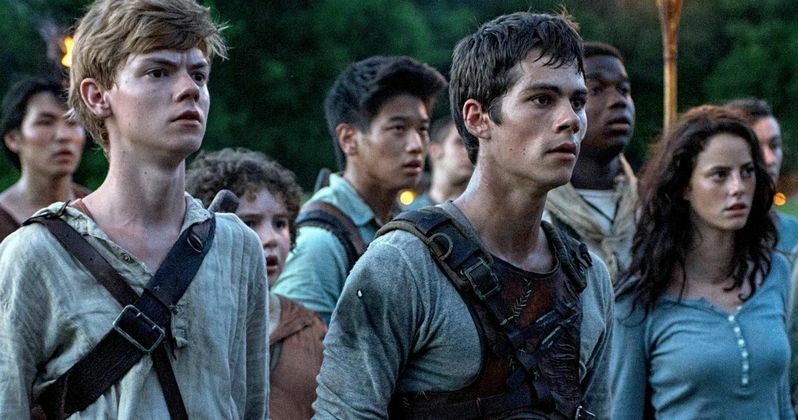 Last year's The Maze Runner proved to be a box office hit, earning $340.7 million worldwide from a production budget of just $34 million. While no cast members have been confirmed for The Death Cure, Dylan O'Brien (Thomas), Kaya Scodelario (Teresa), Thomas Brodie-Sangster (Newt) and Ki Hong Lee (Minho) will likely reprise their roles from the first two movies. The Maze Runner: The Scorch Trials, which hits theaters September 18, follows Thomas and his fellow survivors after they have escaped The Glade, as they engage in battle with the Cranks while searching for the truth about the organization known as WICKED. In The Death Cure, Thomas' memory is restored, as he realizes that WICKED is not to be trusted.